I live in a farm home that was built in the early 1900’s. So, yes, we have done quite a bit of remodeling over the years. But I don’t think there is anything worse than kitchen remodeling. Can anything be more disruptive in your life? My kitchen has not been updated since the mid 1980’s and it’s time to update. As I have embarked on this journey, I have learned 10 things (and probably more before it’s done!) 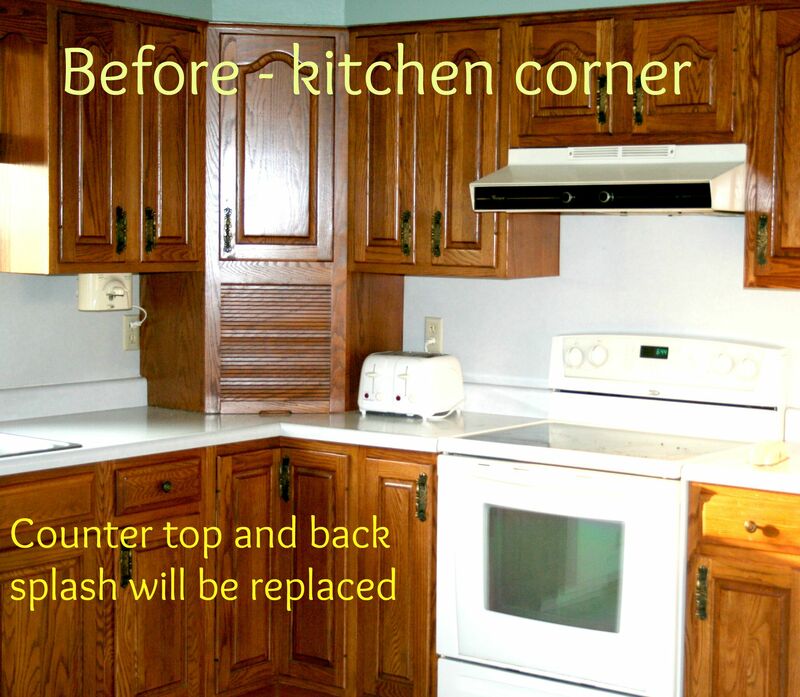 about kitchen remodeling. Yes, my kitchen has some of those “pain in the rear” areas like my drop down countertop. You wouldn’t think a drop down counter would be a pain, but . . . you soon realize that sharp corners and small grandchildren don’t mix well. I have too many nasty cuts, bumps and bruises on heads and grandmas don’t like to see that! 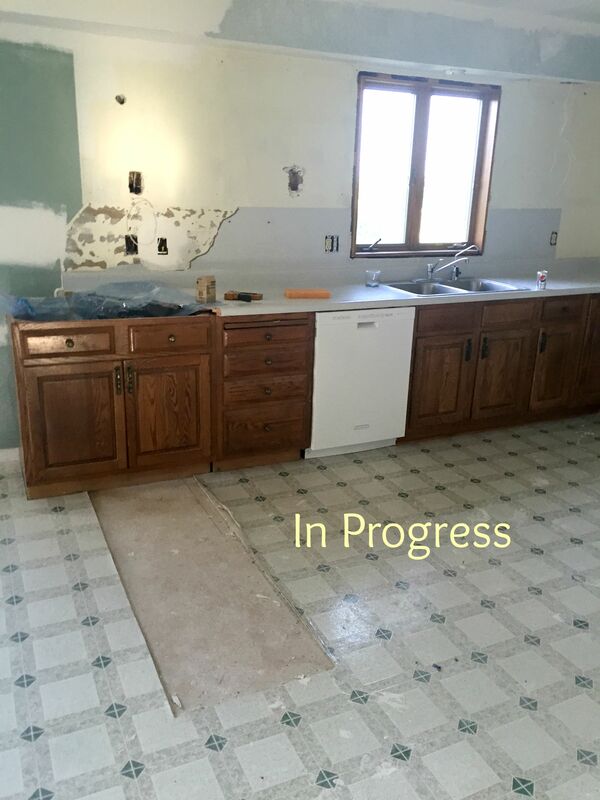 So here is the grand plan – the drop down counter will be taken out to make room for an island. 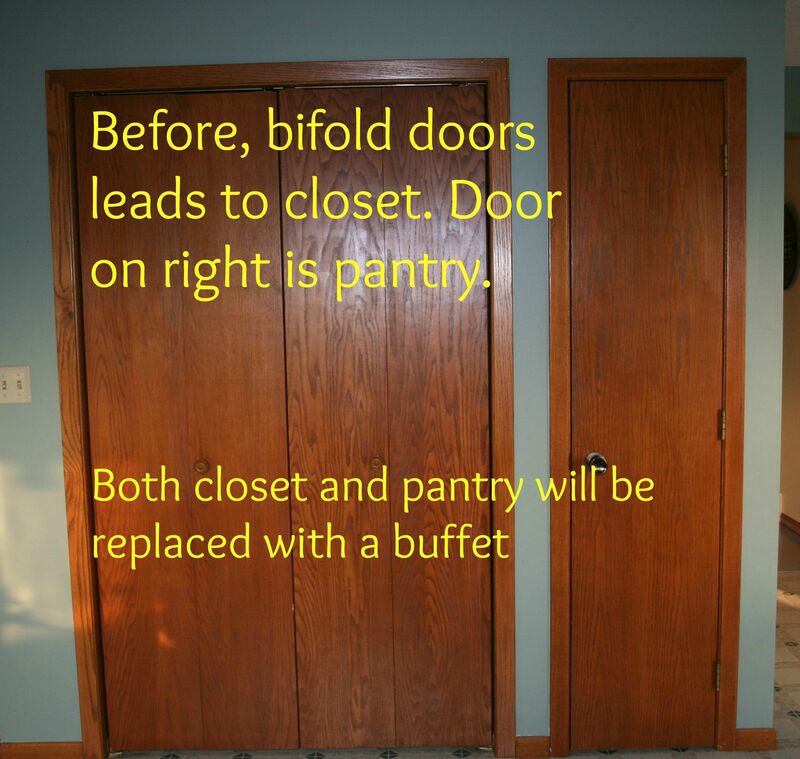 I have a coat closet in the kitchen that is not utilized because the entrance to the kitchen is not the main entrance to my house. That area will be transformed to a buffet area. 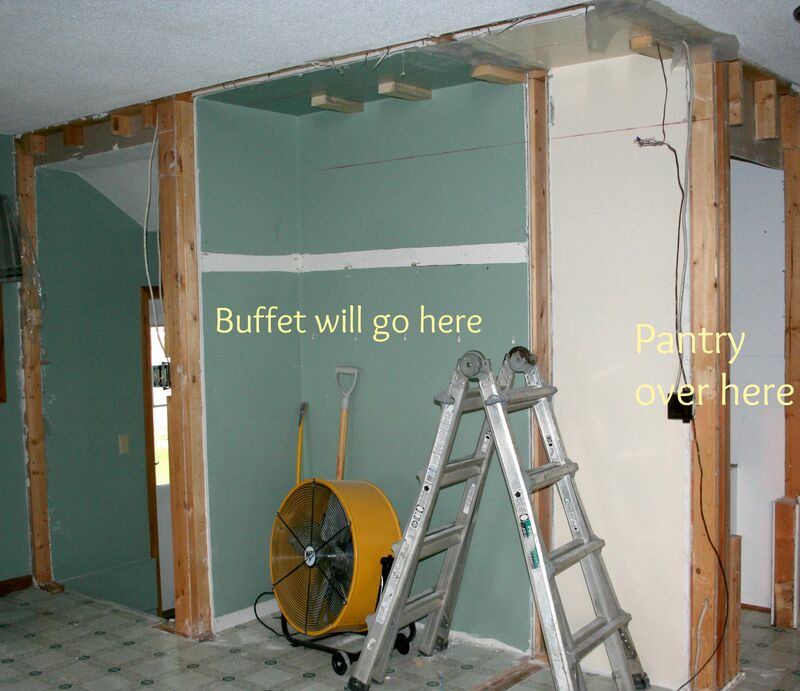 A new pantry will also be built in along with new flooring, counter, ceiling lights. We are frugal. 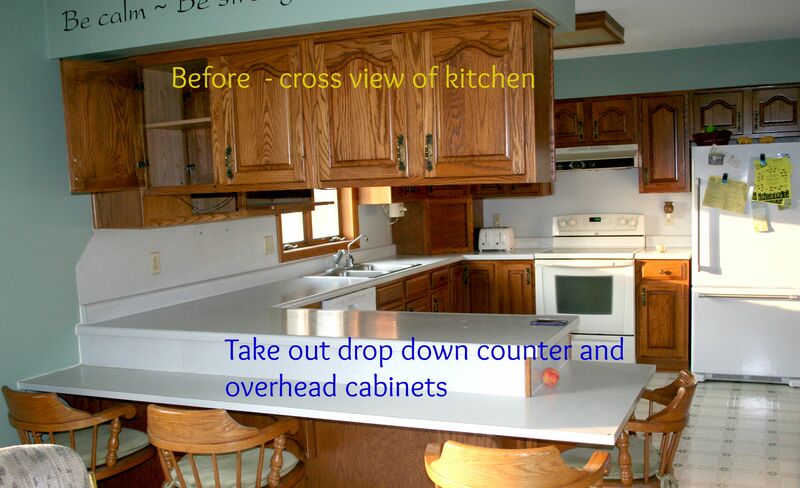 We are trying to use as much of the existing cabinets as possible. To complete the project, we found a custom cabinet maker to build newly needed cabinets that will match my existing cabinets. You will also not see the latest, most expensive kitchen features or products. I am a simple person. Well, except when it comes to vehicles. I do like “extras” on vehicles. For a visual, before and in progress pictures are at the end. For those that are thinking about remodeling your kitchen, here is my top 10 list of lessons I learned. Lesson 1 – Your timeline is not necessarily the timeline of the carpenters. I really wanted this project done about six months ago. One of the most painful parts of this project (for me anyway) is trying to decide exactly what remodeling to do. Both my husband and I are opposites so I knew we would have a hard time agreeing. And we did. Finally, we came up with a compromise we both could live with so we could move forward. That took months. And carpenters don’t always work on your project on consecutive days. Even though we want them to. It’s just how they roll. Lesson 2 – Trying to save money doesn’t necessarily mean you will. Lesson 3 – You WILL find out how many nooks and crannies you truly have in your home. One of our first “to do list items” was to remove everything in our kitchen cupboards. I didn’t realize “how much stuff” I have. (Only 37 years worth!) And it all needed to be moved out. So, thankfully, my laundry room has cabinets. We moved out everything in the laundry room cabinets to make room for my kitchen and pantry food items. Things that were in the laundry room went to the garage. When we finished, I now have kitchen items in my bedroom, living room, laundry room, basement, gazebo and upstairs bedrooms. I realize now, I HAVE WAY TOO MUCH STUFF! Lesson 4 – You will lose items, you will not remember where items are stored and everything is in disarray. I lost my dust pan. Have no idea where it went. Have you ever swept a floor without a dustpan? My makeshift? – a manila envelope. The garbage container is in the laundry room, the silverware drawer is lying on the loveseat in the living room and the toaster is in my bedroom. And I have no idea where my crockpots are at. You want to irritate me? Just ask me where something is. More than likely my answer will be, “I don’t have a clue.” And I hate that. Ugh! Lesson 5 – You will eat in makeshift areas. It really hit me when I came home and found my husband sitting on a folding chair, using the clothes hamper as a table eating his food. Meals are eaten where we can find a place to eat. And, yes, sometimes that means heading to town. Lesson 6 – Everything is a mess. Did I say a REAL mess? Literally. Dust everywhere. I have drywall on the floor. Everything is an unorganized, cluttered mess. Enough said. Lesson 7 – Be prepared for inconveniences. When the carpenters started working, they stapled a piece of plastic between the doorway of the kitchen/bathroom and the rest of the house. Literally, for a few days, I had to walk outside to come in another entrance to use the bathroom. Lesson 8 – Everyone will tell you it’s worth it in the end. Lesson 9 – You improvise in ways you can’t imagine. I needed some cracker crumbs and I had no idea where my rolling pin was. So I used a can of vegetables as my rolling pin. It worked. So maybe I don’t really need a rolling pin? . . . Lesson 10 – I really do hate making decisions. I am a visual person. It’s hard for me to visualize what something will look like. I am a visual learner so I need to see what things look like. 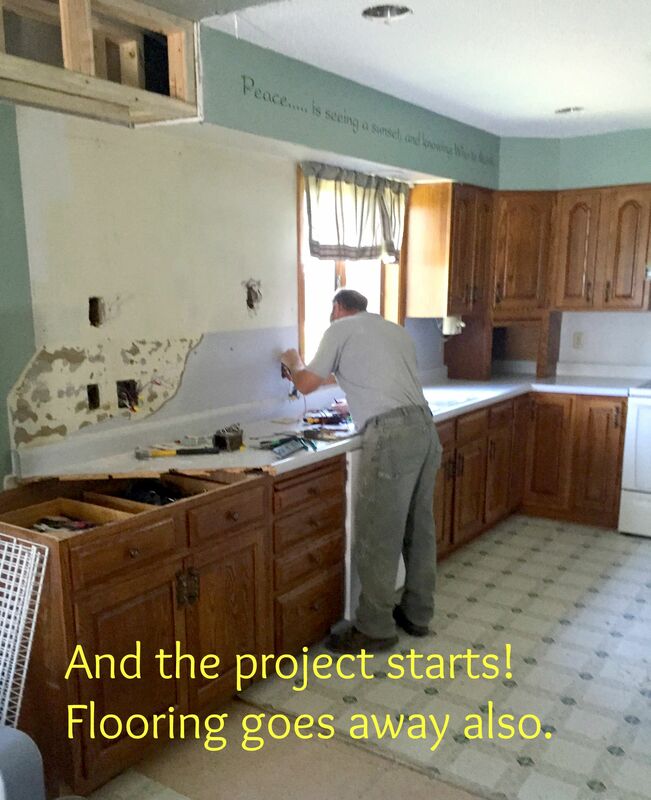 But when you are doing a kitchen remodel, unless you have a specific plan on exactly what you want, you do have to try and visual how something will look like. It’s a challenge for me. But it will be worth it in the end. Right? Ask me in a couple months. So pardon me now while I go to my bedroom to make myself some peanut butter toast. . .
Again, I am pretty frugal. I wanted to keep as much of my furnishings that I could. My dining room. New flooring, dining room table, curtains. Another angle of the dining room area. Found a custom cabinet maker to match our existing cupboards. I did not replace all cabinets because I really didn’t mind the ones I have. My island. And I love it! We use this all the time. Very nice to serve people from the island, especially the grandkids. I kept my appliances. New countertops. Buffet area. I will put in a backsplash in the near future. Because of time constraints, we decided to paint it for now. And I added the pig decal. 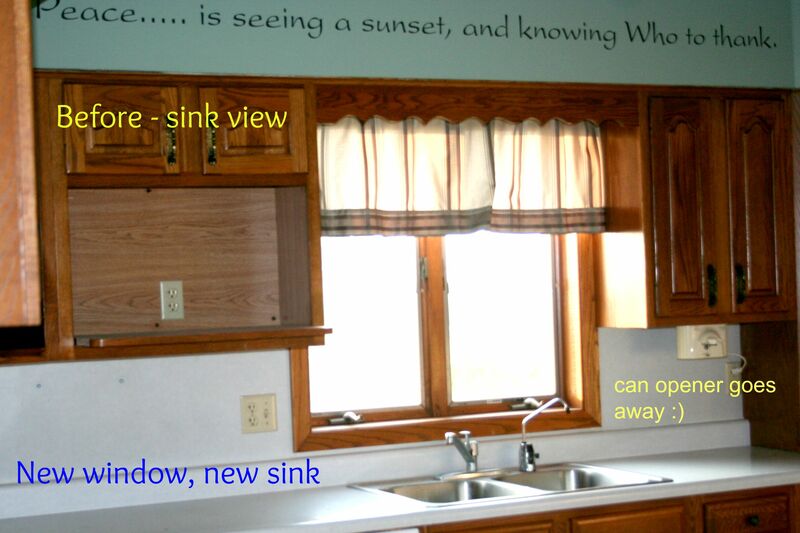 But the plan is to add a backsplash. We replaced a closet with a pantry.